If you frequent Irish pubs in the US, you may have noticed that Kilkenny has been showing up on the taps in a few places recently. It’s a lovely cream ale, but did you ever wonder where the name came from? Actually, Kilkenny is brewed in Kilkenny, Ireland, a town located on the banks of the River Nore in the province of Leinster. 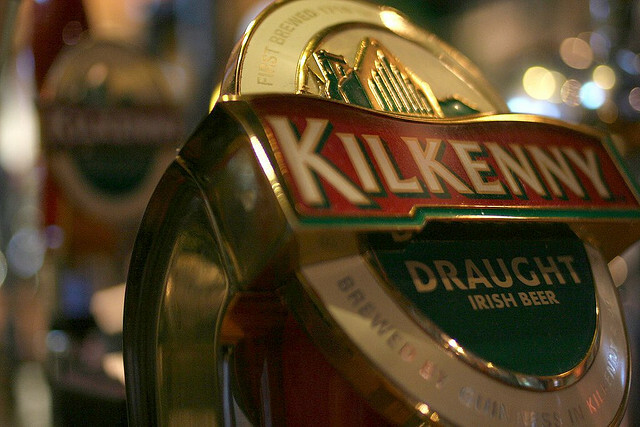 Kilkenny has a long brewing history, including being home to the St. Francis Abbey Brewery, which is the oldest brewery of its kind in Ireland. It is located on the site of a Franciscan abbey, the exact place where the monks brewed beer as early as the 14th century. You can still see the ruins of the Franciscan abbey on the grounds of the brewery today. However, Kilkenny is known for much more than its excellent beer. If you are looking to get a true taste of Irish charm and history, then Kilkenny is a must-see destination. Kilkenny was granted city status over 400 years ago – although it is in fact much older – and that rich heritage shows both in the city and the surrounding area. For instance, Kilkenny Castle was built all the way back in 1195 during the Norman occupation of Ireland. The castle has been extended over the years, but it still retains much of its original medieval atmosphere. It has been extensively restored over the last few decades, and is now open to the public. Another fascinating historical building in Kilkenny is St Canice’s Cathedral. The present Cathedral dates back to the 13th century, and is the second largest in Ireland. Even older is the 100 foot high round tower that stands beside it – this was built in the 9th century prior to the Norman Conquest. The site that the cathedral stands on has been used for Christian worship since the 6th century, although none of the wooden structure from that time remains. If you are planning to stay in Kilkenny, then there are a number of good hotels and bed and breakfasts that you can choose from in the city. However, another option is to stay at Knocktopher Abbey, located on the road between Kilkenny and Waterford – the town famous for its crystal. The abbey was founded by the Carmelite Friars in 1356, and remained in existence until 1737. The country house on the site today incorporates the remains of the original abbey, and now provides luxurious accommodations for travelers in the area. To find out more about the abbey, take a look at the Royal Holiday online newsletter. Aside from its many ancient buildings, Kilkenny is also home to a vibrant cultural community. You’ll find art galleries, craft workshops, theaters and museums to pique any interest, as well as beautiful public gardens and open spaces. The city is also home to the Kilkenny Arts Festival, which features musical events from many genres, including classical, traditional Irish, and jazz. It also plays host to several other festivals, including the Cat Laughs Comedy Festival and the Kilkenny Rhythm and Roots Festival – which features American bluegrass and folk music.